Miners, if there's a blog that needs sixty-one editions (and counting) just to highlight a sampling of your miscellaneous tears, you might be doing something wrong. Check the Code to make sure you're following all the instructions. As for the rest of you, welcome to the latest from the Grab Bag! 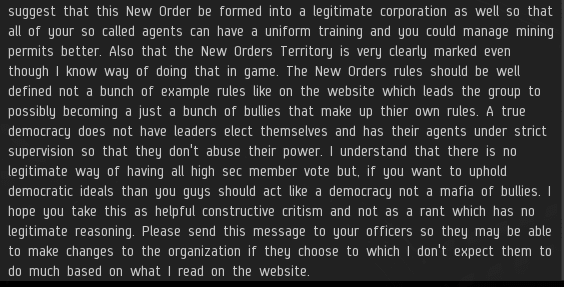 Shortly after the Alliance Tournament match, an anti-Order rebel sent an EVEmail to me and some random people, including liberty. The rebel should've held off writing until the next day, when MinerBumping revealed that in fact CODEdot won the Alliance Tournament. This is why it's so important not to rush to judgment. Wait until all the facts come in. Konrad Grunberg insisted he wasn't guilty of illegal mining. He wasn't mining in the asteroid belt; he was just sitting there "doing his own thing". 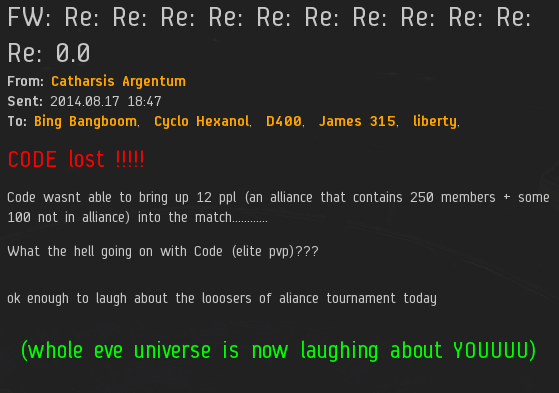 As if the Code permits loitering in highsec! dragoon Ahashion warned Agent Alyth Nerun that the New Order wouldn't be allowed to do any more ganking in the Abudban system. dragoon was mistaken. Never listen to the rebels' predictions. Trust our Agents. They're the experts. William Boeing hates two things: the New Order, and paragraphs. After carefully skimming William's first EVEmail, I shuddered when I saw a second EVEmail from him in my inbox. He had more to say in part two? Oh. That wasn't so bad. This is a classic intercept from the "secret" Anti-Ganking channel. I feel sympathy for our faithful operatives who monitor that place. You need a hazmat suit to spy on a community that toxic. Vyhul Mi was dissatisfied with the way he was treated by Agent loyalanon in-game, so he requested a house call. Like so many other carebears, Vyhul was frustrated by his inability to do real-life PvP to defend the honour of his lost ship--in this case a Helios and Capsule. For some reason, carebears are convinced that their kill-to-death ratio would be improved if they could only punch someone's lights out. 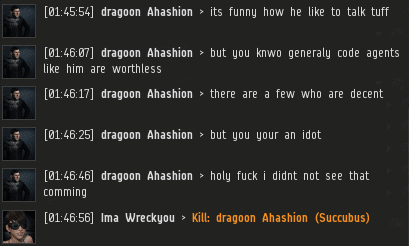 Every highsec miner has powerful friends in nullsec, they're all doing important things on their main, and they're all martial arts experts IRL. Agents of the New Order never back down from a fight. loyalanon gave Vyhul the street address of his personal residence in Somalia. (No town or city was provided, because there are few Smith Streets in Somalia.) For some reason, Vyhul chose not to spring for a plane ticket that day. Maybe they'll meet up at Fanfest and become great friends. You know what the sad thing is? 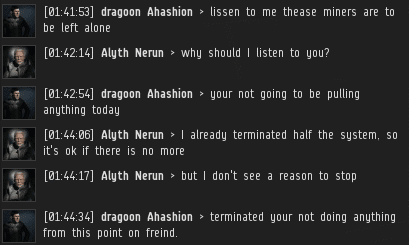 By concluding with "have a nice day", Ding Woot's ominous-sounding EVEmail became one of the more polite pieces of correspondence sent by a highsec miner lately. What a great read, full of quality content! "Agents of the New Order never back down from a fight. loyalanon gave Vyhul the street address of his personal residence in Somalia. (No town or city was provided, because there are few Smith Streets in Somalia.) For some reason, Vyhul chose not to spring for a plane ticket that day. Maybe they'll meet up at Fanfest and become great friends." Proof that even when you give a carebear what they want and help them organize a 1 vs. 1 RL match to make up for their loss of internet spaceship, they still seem unable to follow through on any of their promises. Fortunate for the EVE online universe, brave New Order agents always hold true to their word and are pillars of honor and courage. It's refreshing to see our recent victory over the Alliance Tournament has caused more and more people to undergo baptism by CONCORD and join our ranks, I've literally trained a dozen new agents in the last few days who want to be part of the winning team! Remember, anyone reading this blog: there is no secret handshake or interview to become an Agent. Anyone who who takes any action to support our cause is an Agent of the New Order. Whether it's something big or small, once or many times, within or outside of official EVE channels, whether it's taken by someone we know well or by someone we will never meet - each action intended to influence others for the advancement of the New Order is the action of an Agent. Potential agents - simply join the in game channel "minerbumping" (the password is 315, of course!) and get to know us a little better. Unlike the toxic communities we are purging from space, our channels are open to all and known for high-quality conversation and loads of fun! See you there! Anon 10.04pm, if you want pvp drop your ingame name to 315 miners. I am sure we miners can accommodate you for pvp. Find out just how care bears who support the code, don't mind adapting to take on cowards who don't want to put their name to statements they make. And now BANNED FOREVER FROM AT - REKT!!!!!!!!!!!!!!!!!!!!! Confirming that a fast look over zkillboard will not provide you with thousands of examples of ships that shoot back being killed over and over again - and that the only valid defense a mining ship has involves tears, support tickets, rage, and then finally anonymous posting on our blog until the healing process begins. Please, show us on this spaceship doll where the New Order touched you and we can begin to sooth your sadness. I do believe that this is the right place to use this. You guys and your endless font of rage and tears - EVE would not be the same without you :P Rest assured we take all comments from the same few random Anonymous posters too afraid to post from their mains (after all, you then might actually be held accountable for your words!) very serious, and I will make sure the proper branch of our extensive customer support network deals with your serious issues as quickly as possible. Replace "very serious" with "very seriously" from now on. And not all of us are quaking in fear about posting with our mains (miners tend to be fearful...your repeated gankings may play a role in that). And most importantly, please, for the sake of anything still holy in this game, field a team for your alliance tournament match and try to make a credible performance. You lost the first match by the biggest margin in AT history, Code can and should do better in the second match. Lets not forget that you were given the opportunity to run code however you backed down when given the opportunity to put your words into action. The well known and widely acclaimed poster "Anonymous" shares his carefully gleaned inside information with the blog. I fondly remember sharing my deepest personal secrets with Anonymous, he is truly a dear friend of mine. In fact, dear sir, as regards the AT I do humbly suggest the following. Code should declare a holiday, and suspend all bumping, ganking, and any other highsec operations until the match. All New Order Agents, whether part of the Code alliance or not, should gather together in a single chat channel and commence with a strategic discussion concerning the achievement of victory in the match. Such a gathering of minds, perhaps eclipsed only in the history of our great nation by the giants who declared our independence from Great Britain, would surely find a winning strategy. Imagine if you would: Loyalanon, D400, and DJ Entropy in the roles of Washington, Jefferson, and Adams. And no less important, the newly relieved miners and bot-aspirants of highsec, hopeful of future reprieves should Code progress further in the tournament, would surely participate in the effort to stomp out whomever Code is facing (due to Eve's incompetent technical infrastructure I am currently unable to load the bracket). Against the combined efforts of the Code enforcers and the highsec carebears no force could ever hope to prevail. veers didnt get the memo that his ideas for code were ignored as he hadnt actually done anything himself. looking forward to his 3 hour cry fest that was recorded being released on minerbumping in the next few days! Suffice to say Mr. Anonymous (even New Order supporters are now too cowardly to post from their accounts? Seriously? You guys are becoming miners? ), that the hopefully to be released UNEDITED recording will show the truth of the matter, and who is engaging in a "cry fest." 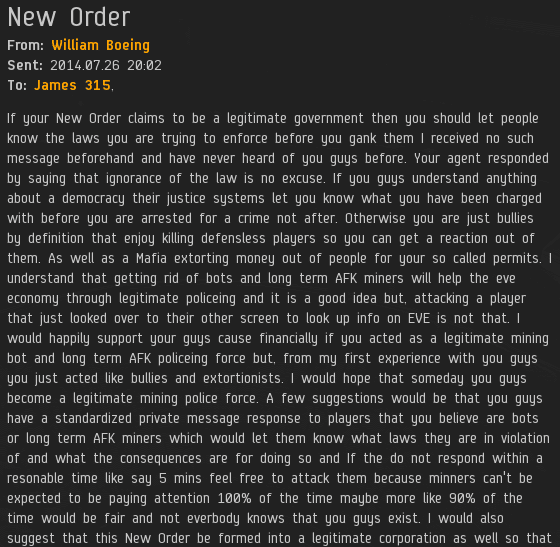 Is it the New Order Agents who gank miners, and make them cry, extorting them into purchasing a permit, and therefore justifying their miserable profession? Or is it Veers, who does not want money from the miners, who does not want them to buy a permit, who does not gank them, or even bump them, but who, instead, wants mining to be removed from Eve entirely (Eve forum post to follow soon), and who engages with miners to help them explore other content in the game, like highsec missions and incursions. We record, you decide. And congrats on the forfeiting the AT and being banned from participation forever....great job. Oh man. That moment where you burst out laughing while on the john. Thanks to William Boeing and the Supreme Protector's wit for that moment. I love wormholes, tell me which one you're in and I'll move in and join you! p.s.s to any other Corp / Alliance just do it, here in public at their own blog! What does enforcing the law have to do with some dumb tournament. ?